This is the only key ring that actually has a key with a ring built into it. 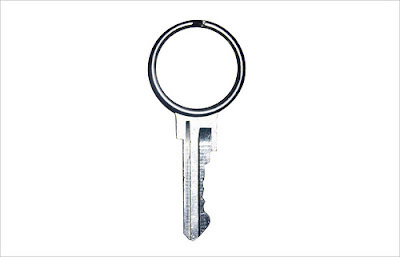 It's incredibly clever: a blank key that serves as the ring. You cut it to fit the lock you use the most, then attach your other keys to it. Some ideas seem so obvious once conceived. Agree? The best part is that this is one design you can actually own! Buy it at Amron Experimental. Have you seen any other clever designs that you just wish you'd come up with? Leave a comment!